This is the perfect custom / personalized prince design for any young boy. We have created a layered pattern, where the first background is a simple tone on tone crowns pattern. We then layered it with our curved custom text and graphic, where we used "Prince" and "William" as the text and we used a graphic of a prince on horse. We chose light blue color for the background. 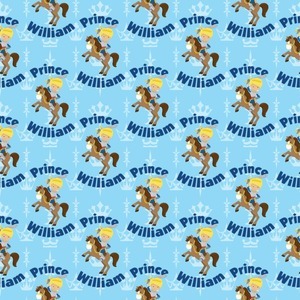 We used the personalization of Prince William. We chose the graphic of a Prince riding a horse; the prince's hair and skin color can be customized; our Prince has blonde hair and fair skin.